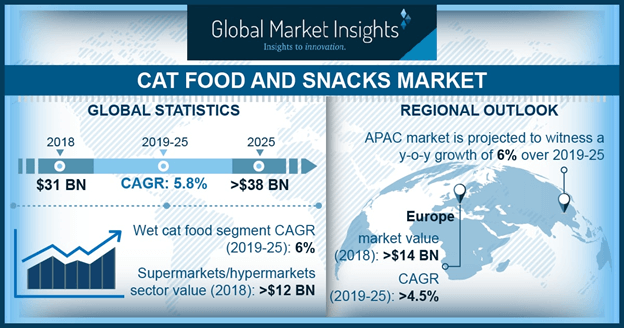 Cat Food and Snacks Market size will surpass USD 38 billion by 2025; according to a new research report by Global Market Insights. Global cat food and snacks market size is majorly driven by increasing trend of humanization by the pet owners. The global pet care business generated revenue close to USD 90 billion in 2013 and surpassed USD 115 billion in 2018, with growth close to 5% over the past five years. Besides, pet food accounts for approximately 70% of the overall revenue generated by pet care business. Thus, humanization of pets will subsequently boost cat food and snacks market size by 2025.